This magnificent extension provides merchant the ability to sell desired products on auction. Joomla Virtuemart Auction provides a changed pattern in which buyers acquire the products. This allows the user of the site to bid in the auction with competitive prices for their preferred products. Well integrated with Joomla Virtuemart site. The concept of Email has been provided for bidder, auctioneer and outbid buyer. Functionality to hide add to cart button and price details from listed auctioned products is available at the backend. Functionality to set auto increment in bid value after each bid is available. A feature of automatic currency converter is available. It allows the amount of auction to change according to the currency selected. Option to define winner of a particular can be managed manually/automatically as per the admin’s configuration. Option to set Email layout is available at admin end. Admin can choose various properties related to front end view which includes the background colour, border colour and border width. A separate tab is provided to maintain and manage the history related to auction. All the bids placed can be viewed separately for that particular product and the manual winner can be decided from there. Option to select winner manually before auction end is available. The concept of countdown timer is displayed on auction products if the auction is active. The facility to avail the functionality of auction is available for the registered user. Now if a user is not login, Display login module in a popup instead of redirecting for login. After installing the extension, plugin and component get automatically installed. To view the component, go to component as shown below in the snapshot. Click on “option” to configure the settings. An user guide is provided to set up the mail template. click “auto” to allow system to decide the winner of the bidding. click “yes” to show last bidding on auction product. select “yes” to display the minimum and maximum quantity of auction product winner needs to purchase. select “yes” to hide the display of product price at the time of auction. select “yes” to hide the “add to cart” button for auction product. click “winner” to avail the purchase of auction product to winner of the bid. The winning bid will be the product price. Option to set the background colour, border colour, colour of countdown timer and manage the border width for auction product box is available. 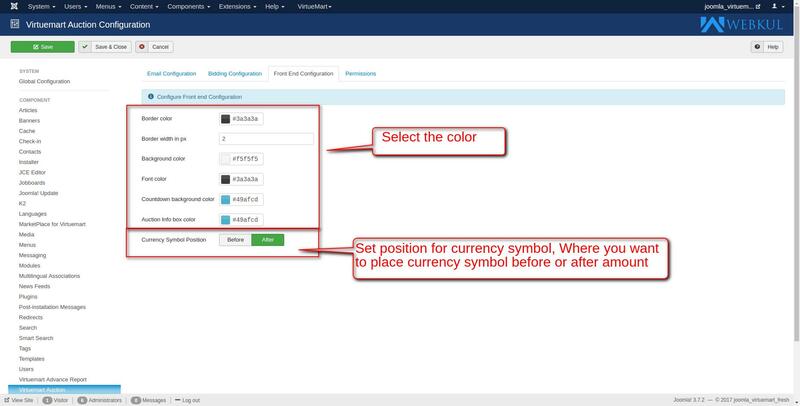 Also, admin can set the position( Before/After) of the currency symbol. In the “product” tab, all the Virtuemart products get listed automatically. 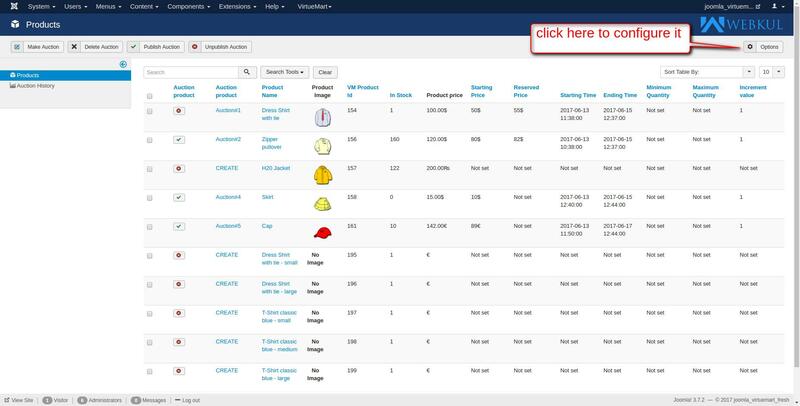 To create an auction for particular product, click on “create”. Set the parameters as listed below. Set the starting price of the bid. Set a reserved price which admin is willing to accept for auction product. Enter a start and end date of bidding. Enter the minimum and maximum quantity winner can purchase. Select “yes” to allow increment option and set a value for the same. 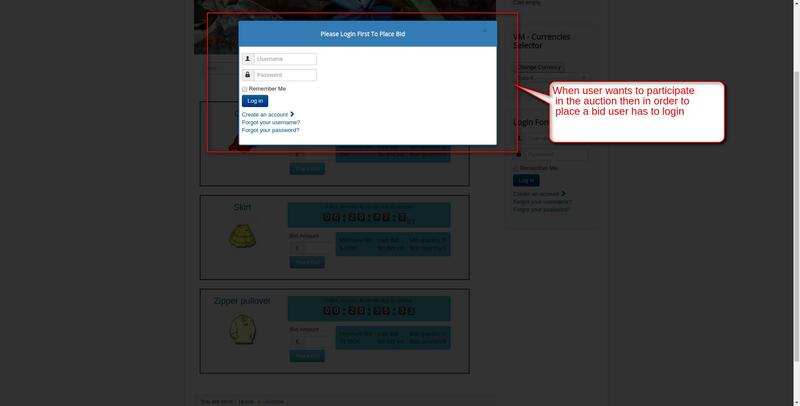 Once a auction in created for a product, an auction id is generated as shown below. Any user can see the auction but in order to place a bid user has to login first. View of auction product displayed at frontend. Click on desired product, go to “bid placed”. Here you can view the list of bid placed for desired auction product. Click on “Auction History” to view the details of auction as shown below in snapshot. What can be done to improve the response time, after placing a bid, from 20 seconds to less than 5 seconds? Does the auction software/script require virtuemart? or is the Auction for Virtuemart a standalone product? To use this addon, you must have Joomla and VirtueMart. This is basically addon based on VirtueMart. Is it in french ? oooops 4 days without answer…. Hope we won’t need assistance with the script. You can create a support ticket by sending the mail at support@webkul.com, so that our developer will help you. I have all working, 1 thing not. I can not get this inside “sublayout” at template, what was inside download. Now you need to login, than you see bid products and the last bid price. To boost visitors to login we need that the price is directley visible, the last bid. Than login en than bid. Or that you can see all product without login, only not the feeld to make bid, there ” login to bid”. 1: Is this extension ok for Joomla 6.2 and VM latest version 3.x ? 2: Is it possible to have some products than normal, and some with bid? Yes, it is possible to have some products in bids and some in normal. Also we have received the same query in our support ticket system, so if you have any other query then please reply in support ticket.